Want to convert MOV to DivX AVI so that you can play the files in Windows Media Player, edit in Windows Movie Maker, play on AVI portable devices? If it's the case, then look no further! In this article, we'll show you how to convert MOV format to DivX with ease. 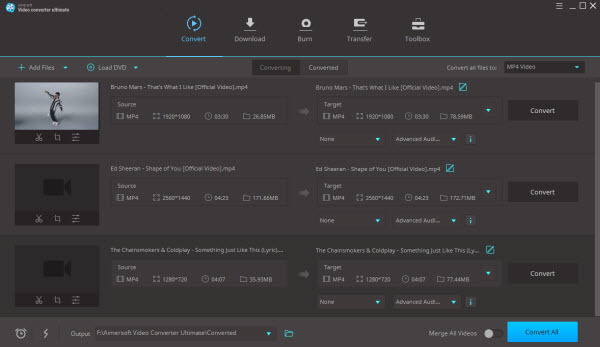 The tool recommended to help you finish the conversion is Aimersoft Video Converter Ultimate. It will processes MOV to DivX format without essentially causing loss of quality. In addition to MOV and DivX, this video converter can also convert AVI, WMV, MKV, FLV, M4V, 3GP, M2TS, MPEG and more. Moreover, the built-in video editor lets you customize your videos to get the very part and effect you want. If you're using a Mac and want to convert MOV to DivX in Mac OS X (Mountain Lion included), Aimersoft Video Converter for Mac will do you a favor. Now download the right version according to your situation and follow the steps below to get your work done. The guide below uses Video Converter for Windows screenshots as an example to show you how to easily change MOV format to DivX in Windows (Windows 8). The way to do the conversion on Mac OS X (Mountain Lion) is the same. Just make sure you've got the right version according to your situation. Run the Aimersoft program after downloading and installation. At the top of the toolbar, click the Add Files to locate the MOV files and open them in the program. Or you can directly drag and drop files to the item bar to load them. All loaded videos can be previewed and you're free to take snapshots of any movie scenes. Tips: There is the video file list where you can set the output settings for the conversion. You can select the video pane, frame rate, resolution, bit rate as well as encoder for converting the videos. Next, choose the conversion option at the lower end of the screen that matches the file you wish to convert. To convert MOV format to DivX, simply browse to find DivX from Output Format > Format > Video and set it as the converted format. The last step is to click the Convert button to start converting your MOV videos to DivX. Just sit back and relax while your video files get converted to your desired format. After the conversion, click Open Folder to find the final converted files. And that's all done!